KaMOS® has developed a new method for a faster way to install BlindPlug after leakagetest by using KaMOS® Patented gaskets. 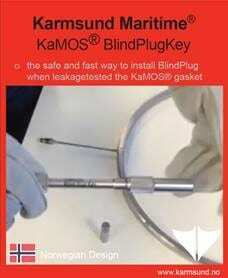 The KaMOS® BlindPlugKey can be used in all flange connections making the installation of BlindPlug easy even for the diver. There will no longer be no need for use of hands or other tools between the flanges. Installation of the BlindPlug is easy.